Tomorrow, my home state celebrates the arrival of Brigham Young and other early pioneers to Salt Lake City in 1847. These early pioneers referred to Utah as the “Beehive State,” to reflect the qualities they held dear – qualities of industry, perseverance, thrift, and self-reliance. I grew up with a mother and father who instilled these same qualities in me. As a young girl, I was expected to contribute to our family by completing my weekly “Saturday Chores,” weeding the garden, helping Mom can fruit, and cleaning Dad’s office along with the rest of the family. In my early teens, Dad hired me to call prospective clients and schedule appointments for them to meet with him. I was expected to contribute half of the money for school clothes, trips, and education. I worked until I could no longer work. Following a bicycle accident nearly four years ago where I suffered a traumatic brain injury, I was unable to return to my work as a nurse manager. I was devastated. Nursing had been my life for 20 years. And now I couldn’t make my brain work. I was instructed to sit quietly and avoid over-stimulating my concussed brain. I couldn’t read or look at a computer screen or watch television or listen to music without severe consequences. It was difficult to carry on a conversation or keep my balance. My neuropsyche exam showed severe cognitive impairment. And I panicked the first time I went back to church a block away – when I walked out the doors at the end of the meeting, nothing looked familiar. I didn’t know how to get back home. An angel friend encouraged me to trust God. So instead of working in the traditional sense of the word, I worked on LISTENING. I rekindled my faith – I sat quietly – and I looked to God. Others cleaned my home and mowed my lawn and cooked my meals. And I sat quietly while the world continued to buzz around me. The other day while sitting quietly in my garden, I watched for over an hour while dozens of bees darted here and there and buzzed around my beautiful sunflowers. 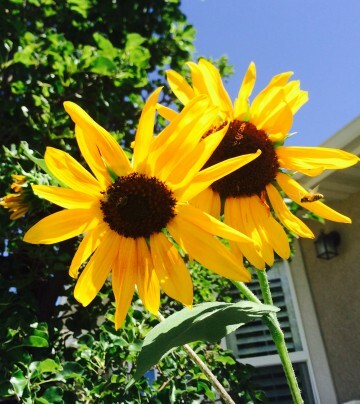 And I was reminded by God that the sunflower has every bit as important a calling as the busy bee. The sunflower that gifts its sweet nectar, looks to the light and shares its beauty just by BE-ing. And while we in our human form have defined what “WORK” looks like, God has his own definition. And together, the bee and the sunflower both perfectly fulfill God’s divine purpose. This entry was posted in Uncategorized on July 23, 2015 by Wendy Parmley. 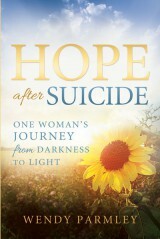 Official website of Wendy Parmley, author of Hope after Suicide: One Woman's Journey from Darkness to Light. Hope after Suicide: One Woman's Journey from Darkness to Light. is published by Cedar Fort, Inc.